The word ‘Royal’ fits perfect to Rajasthan. Jaipur (capital of Rajasthan) is one of the most famous tourist destinations of India. It is also a gateway to other tourist’s destination in the entire of Rajasthan which includes Udaipur, Mount Abu, Bikaner, Jodhpur and Jaisalmer. It has a lot to offer to its visitors from its handicrafts to royal furnishings, an altogether different clothing style, enlarged list of palaces and forts where its history used to reside once. Named after its ruler Maharaja Jai Singh II, this city leaves you with the tremendous amount of history and its culture. History behind all forts and palaces are still alive when heard from the mouth of tourist’s guides available at every fort & palace. Jaipur provides a long list of accommodation from budget stay to luxurious stay. It depends on our pocket and choice what we wish to go for. 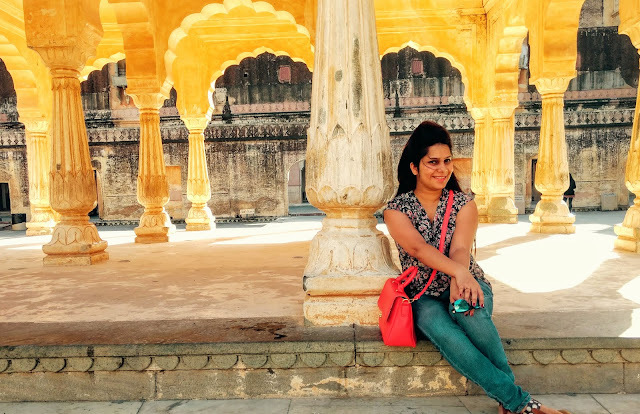 It is time to welcome ourselves in the old city of Jaipur, which is truly a pink city. We found all the buildings including all monuments colored in Pink and that is why the city is known as ‘Pink City’. I was truly getting impressed by it. We spent almost 3 to 4 hours shopping. Bargaining is fully possible at small shops in the old city of Jaipur. 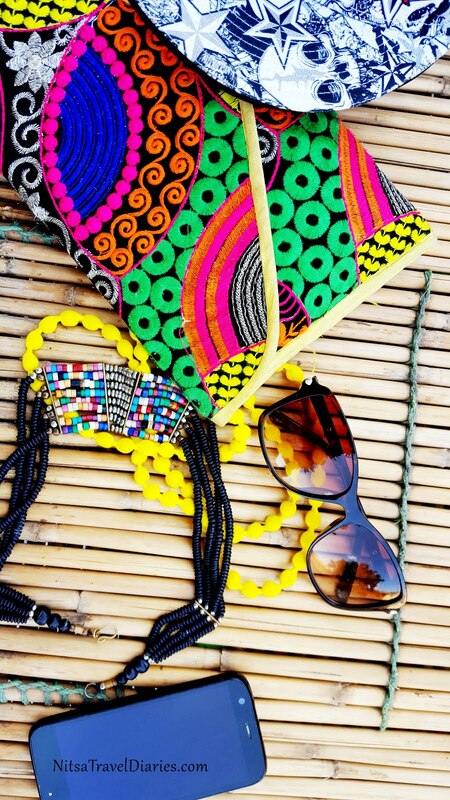 The same items which were there inside the forts are also available in the market at much cheaper rates. I recommend not shopping for any items from the shops located inside the forts or palaces. Live like a Queen!! Google Maps on the rock!! We have easily reached our destination ‘Umaid Bhawan’ in Jaipur. It is located in between residential area “Bani Park” away from hurly-burly of the city. The Bhawan is designed completely in antique manner. Its architect is exactly like a palatial bhawan. With antique furnishings as well as walls, varied options of rooms are available here. We had actually booked three of the deluxe room there, but due to availability they upgraded one of our rooms to ‘Suite’ room. Wow. RoyalDeluxe Room fully air conditioned with comfortable beds, antique chair, antique lamps and floral paintings. Separate sofa room equipped with sofas, table and a dressing table. Royal Suite Room equipped with a private balcony. It provides us a feeling of royal ambiance. Double bedding with curtains all round. This was a perfect Budget stay for us, to experience a luxurious stay. Well spent few hours enjoying the beauty of the’ Umaid Bhawan’. There is a small ‘Ganesha’ temple at the entrance of the UMAID enhancing the beauty of the view. There also exists a small park nearby pool area with a beautiful sculpture of ‘Lord Buddha’ and a fountain, proving them to be the real ornaments of park. With such a peace loving environment our parents loved there stay here. Staff takes a lot care of cleanliness. The ‘Umaid Bhawan’ is little congested due to lots of architectural designs in one small area. Three storied building also had an option of lift that too of old architecture. Third floor has a roof top open restaurant and a roof covered AC restaurant, both. We had our Breakfast at ‘Umaid Bhawan’ for both the days which is average as per my ratings, with fewer options. We found their ‘Poori Chhole’ quite tasty. There is no gaming zone in this hotel. Visitors do prefer to spend some time in leisure activities like table tennis at their accommodation only. Besides gaming zone they provide us with swimming pool and also organize evening cultural program every day from 7 pm to 9 pm. 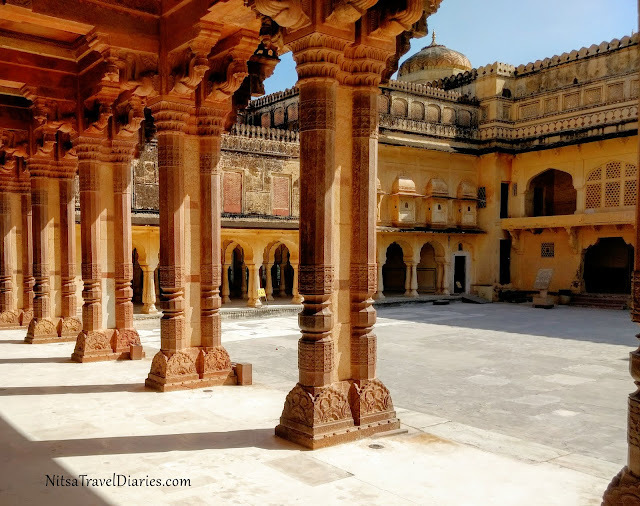 City Mahal a complex of palaces which includes Chandra Mahal, Mubarak Mahal, Mukut Mahal, Maharani’s Palace, Shri Govind Dev temple, and the museum, comes with an Entrance ticket of Rs. 150 for Indians and Rs. 500 for foreigners. This city palace is located in the middle of Old City of Jaipur. Parking was available just outside the Mahal with very heavy parking charges. Huge public was there to visit this Mahal even during off season. After done with our visit to City Mahal, we were interested in having ‘Matka Kulfi’ to please ourselves in such a hot weather. There were two vendors for the same. We tried kulfi from both the vendors costing Rs. 30 each. But kulfi of one of them was quite delicious. He is selling his Kulfi’s there from last 40 years. Many big actors and actresses also had his Kulfi while their shooting. He has also got those pictures captured which can also be seen there. Chokhi Dhani was a travel of more than half hour from city. It is a kind of cultural night program based on its native culture organized basically for those who are naïve of its culture. The place is equipped with lots of entertainment activity. They welcomed us with a turban and ‘tilaka’ on forehead. This gesture is the actual reason for us entering Chokhi Dhani with a smile on our faces. There we found pack of traditional entertainment shows which includes wrestling or acrobats, Magicians, puppeteer show, fire acts, traditional dance etc. Entertainment activities includes Camel Ride, Bullock Cart Ride, Hand Reading, Horoscope Reading, Maze game, Vaishno Devi Temple, and many more fun games for kids at reasonable cost. At the end there also exists a shopping mart which is not of much use as per my view. You can find better stuff at much cheaper price in the local market of Jaipur. Even I didn’t find the quality much convincing. Parking at chokhi dhani was also not a big deal. Proper parking place is there for visitors. Washroom facility is also available there inside, which was very clean and tidy. Jal Mahal, also known as Water Palace, floats on the water of an artificial lake called ‘Man Sagar Lake’, about 400 years old. No ticket is required to visit and see this place. The palace is not accessible for general public. It can only be viewed from outside the lake. Various food/drink vendors were also available there. I felt blessed to see ‘’Nariyal Pani’ there in such a hot weather. It is located on main road of Jaipur, so parking is not a difficult task there. We were easily able to spend an hour there and had fun with photography. Fun part is that we found a magician kid at every fort or palace. Jaigarh Fort is famous for the world’s largest canon which is sill operational and its water tank. It is a 1000 years old fort (As told by Guide). To take a note, there is no need to park your car outside; we were allowed to take our car up to the fort with parking charges of Rs. 50 at Dungar Gate. It took us approximately 2 hours exploring Jaigarh Fort. I recommend taking tour of the forts early morning or during evening, as it is quite hot in Jaipur. Visiting hours generally for all forts/ palaces/ museums is from 9 am to 5 pm and entry ticket costing Rs. 50 per person. Small food/ drink vendor options is also available at this fort. Nahargarh Fort is again a renowned fort in jaipur, (Also Popular after Water Jump Scene from rang de Basanti) located on the way to Jaigarh Fort. It is also starting a wax museum soon. Famous for the view of the pink city it provides from above, there exist 9 identical rooms made for 9 queens by the king. It charges you an entry ticket of Rs. 50 per person. Canteen here is also an open roof canteen. I recommend hiring a guide from outside this fort gate because they offer you the cheapest rates (We hired for Rs.50). Amber Fort is the most popular and the most beautiful fort in Jaipur. Adjacent to which is a ‘Jodha Palace’ too. Your entry ticket costing up to Rs. 100 per person includes visit to both the palaces. View from the fort is just amazing. It is a must visit place in Jaipur. It is situated on hill top, approximately 25 minutes drive outside the city. There are more than one entry gates to this fort. Parking was available just outside one of the entry gate (with parking charges of Rs. 40 at Chandpol Gate), so no need to climb up the hill altogether to visit the fort. It is a combination of both fort and Palace. We found its garden and ‘Sheesh Mahal’ as fascinating. A Cafe Coffee Day is also available inside the fort. Guide charges here are fixed and no negotiation can be done(Charges Rs.200). Guide is preferable to visit any monument as per my view otherwise it becomes sort of boring visiting these forts. Hawa Mahal is situated in between Jaipur city (In Pink City). It is also known as Palace of wind and known only for its architectural design from outside. Its entry ticket is just Rs 10 and located nearby to City Palace. Its parking and entry is from the back side of the Mahal. It is a five story building and the view from the top is amazing and not preferable for oldies. You won’t lose anything if you skip its visit and just admire it from outside. Jantar Mantar is located near to Hawa Mahal and City Palace. It is an astronomical observatory in Jaipur that is used to calculate time, track star location, and many more. It comes with an entry fees of Rs. 200 per person and extra charges for cameras is found to be charged in every monument in Rajasthan. Not to miss this kind of place (But the entry charges for small place is quite high), it was really fun visiting Jantar Mantar. One Jantar Mantar is also situated in Delhi with similar vision. Birla Mandir owned by Birla Group of Industries, is a Narayan (Lord Vishnu) temple. The entire construction of this temple is done by marble. Parking space will not cause any problem at this temple too. It is well maintained and clean structure. Evening is the best time to visit it when you will be free from visiting all other monuments which will be closed by 5 or 6 pm. Shoe stands are also available there which are also chargeable but with a very minimal amount of Rs 2. As per Hindu culture, we need to remove our shoes before visiting any temple. Photography is again not allowed here. Quite peaceful and calm, was a worth visit to this temple. Jaipur Zoo is a fun place and a must to visit for kids. Kids enjoy visiting such places. It is a very small zoo with limited amount of birds and animals. Entry ticket of Rs 30 per person will be charged and its closing day is Tuesday. It is divided into two zones for birds and animal separate. LMB Hotel is one of the renowned places for eating and one of the oldest. Ask your oldies who had been to Jaipur before, they must be aware of this hotel. It is happening with me as well. All of the oldies in my family are asking more often about my visit to LMB hotel. As per my experience, the food was not ‘ultra tasty’ but you can say it was ‘only tasty’. The prices are high as per services but ambience is decent. Foreigners as well as Indians prefer this hotel in jaipur at priority. Outside LMB hotel, they also have a ‘Sweet and Namkeen’ shop. We ordered Dal Makhni, Kadhai paneer, Butter Naan, Tandoori Roti and Raita. Dal Makhni was the tastiest among all. Naan was also cooked properly. Overall our experience was good. Parking was not a big deal as it is located in market area, we parked our car in front of one shop across the road. Chokhi Dhani provided us with varied options of dining, listing one by one below. Entry ticket to ‘Chokhi Dhani’ is based on your choice of dining. Sangri is known for its Rajasthani Thali. It is a hall where guests are served on leaf platter in tradition of Manuhaar. Dining here will cost you an entry ticket of Rs. 600 per person and Rs. 350 per child. Chaupad is yet another dining hall of chokhi dhani specially known for its shape. It has four straight rows meeting at center, each row with a capacity of 20 people. Gorbandh is an open air dining known for its Rajasthani Thali where food is cooked in pure Desi ghee. 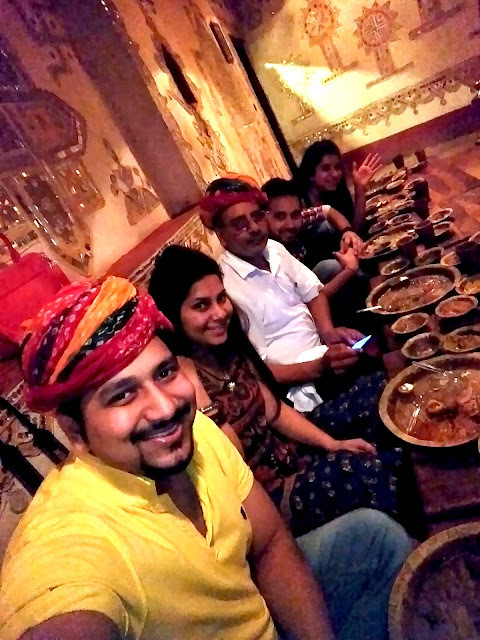 Royal Fine Dining is a multi- cuisine restaurant giving you a royal experience, where you can find other food as well besides ‘Rajasthani Thali’. Dining here will cost you an entry ticket of Rs. 950 per person and Rs. 650 for child. We opted for Sangri, as we wanted to experience the Rajasthani food and their tradition. I just loved their food as it is less spicy and I believe it is not only the food but the way they present the food and the love with which they serve you food. Buffet of Rajasthani Thali also available at other restaurents also. Kalyan Rooftop and Indoor Restaurant provides us with the great view and atmosphere. 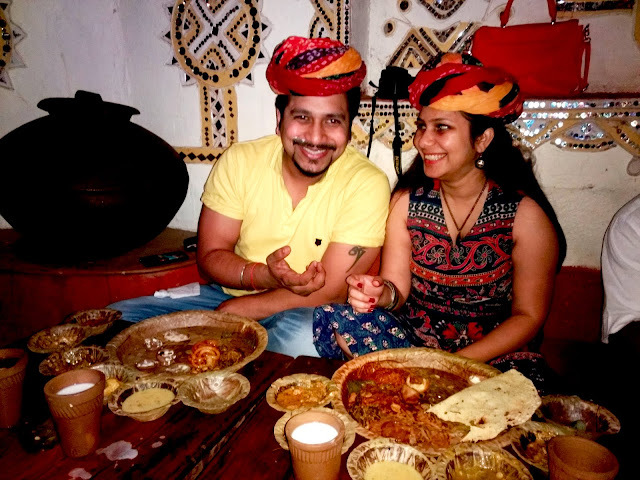 Rajasthan is famous for its roof top restaurants and this rooftop restaurant was our first experience of rooftop in the entire of Rajashtan. The menu was very vast, so it was getting very difficult for us to decide what to eat and what not to. Haha. We always long for proper food when it comes to restaurant, so we again ordered our proper north Indian style food. The food was average, but the soothing music in the background and a nice ambience enhanced our experience. Umaid Bhawan Roof Top Restaurant it is the same restaurant where our stay was. We had our breakfast here for both the days. As already mentioned, I give average rating to its food. It provides fewer options of breakfast. ‘Poori Chhole’ were quite tasty. At dinner time, they organize a cultural program in front of dining area. But due to little less space, the people sitting at the back side of the restaurant were not able to view the program. I found the foreigners enjoying the program and dinner a lot. The dinner is quite tasty with their Dal makhani not to miss (My personal Favorite). Though we enjoyed a lot in Jaipur, we were all excited to explore more of jaipur even in such hot weather. Somehow I felt the police of jaipur is not in favor of tourism. It is really bad of them but we found them stopping and harassing tourist vehicles only. Local vehicles with the same faults were not even entertained by them. They were also asking for a chalan of almost double the amount from tourists, compared to what is set by the government. I fully abide by the traffic rules whole heartedly. It is there for our own safety and concerns. But the rules should be same for all. By mistake I set high beam at night in city. They stopped our car for the same reason, where they were not at all entertaining the local cars for the same reason. Also when we asked them to stop other cars on high beam, they started talking very badly. It didn’t happen one or two times. We were stopped by them four times in two days. Frankly speaking, you will get to see lots of places to shop at, but the best place as per my experience and recommendation is only the market in the old city of Jaipur (near to Hawa Mahal). There you will find places like Johari Bazaar, tripolia bazaar, Nehru Bazaar, Bapu Bazaar and ChandPol Bazaar. Rest all the market including shops at forts, palaces, museum, chokhi dhani or any market in new jaipur would be a waste of money. We got lots of items to shop there including ornaments, accessories, handicrafts, room decorative, clothes, shoes and many more at the best cheap price. Bargaining was also possible there. We had a fun time there. LMB hotel was also situated in between the market area.